This week I have something special to thank my readers! Since the seasons are changing here are my spring favourites! Also I have teamed up with Luvocracy to help you start your spring well, read to the bottom to find out details about the giveaway! During spring I tend to opt for a lighter more natural look. I like to have a ‘fresh face’ look in comparison to my bold looks from the winter months. 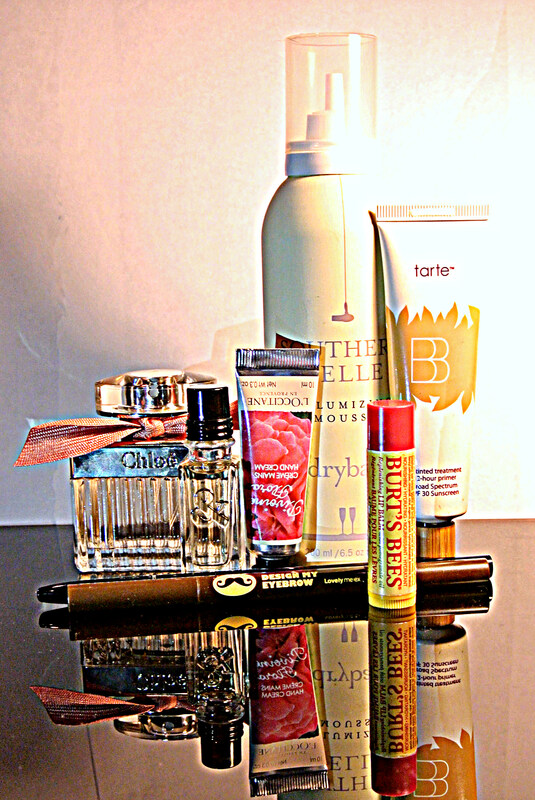 The following will not be full reviews but a little bit on why I love these items for spring. I can write lengthier reviews on the products bellow if you guys would like just leave me a comment with the product name! This was the first thing I thought of when gathering my spring favourites. It is a beautiful sweet rose smell and it will remind you of spring and flowers. The perfume comes in the signature Chloe bottles but with a cute little rose pink ribbon instead of the original tan. You really must go to a perfume counter to smell this! This is for the jasmine lovers! I find the smell of jasmine so beautiful and subtle and this was definitely a find! It is rare to find the smell of jasmine well replicated in perfumes, but L’occitane did an amazing job while mixing it with a hint of bergamote to create a beautiful fresh scent. L’occitane carries an amazing collection of shea butter hand creams, and this would be my choice for spring time. If you love the smell of peonies you should definitely give this one a go! This moisturizes your hands without leaving a greasy or sticky residue and smells amazing. One of the best mousses I have tried! I love the body and volume it provides without the heavy and sticky feeling in my hair. I did a full review on this product, click here to see it! This BB cream does not feel or apply like the Korean or Japanese BB creams on the market. The Tarte BB cream is instead a combination of a silicone based primer and a foundation. It is about a medium coverage with amazing ability to blend into the skin flawlessly. The BB cream felt amazing and smooth on my skin, it did not look or feel like I was wearing foundation. This is my go to foundation when it comes to doing a natural ‘no-make up’ make up look. Lastly, it also contains SPF 30 sunscreen, to protect your skin from the sun. The Tony Moly eyebrow pencil is a decent dupe for the Anastasia Brow Wiz and a lot cheaper. It is almost as slim as the Anastasia Brow Wiz and gives you a very natural look to your brows. They also come in about 6 shades from black to light brown, giving you a good spectrum to find the perfect colour. I love to use two similar colour on my brows to give them a little more depth and dimension. I use this in combination with the Tony Moly eyebrow pencil to create brows that look naturally full. I opt for 2 different pencils because using one looks flat and 2-dimensional. When I use both my brows do not show obvious signs of using a pencil at all, yet they still look full. I love using this on my lips to complete my natural look. It hydrates my lips without feeling greasy and gives my lips a very subtle and sheer natural red to my lips. Not only does it look great but it is also made with 100% natural ingredients, this product is a great value for what you get. I have team up with Luvocracy to do giveaway for my readers! Luvocracy is an amazing site where you can look at items that people have ‘luved’ and purchase them right off the site! We want you to start your spring off well so all the products above can be found in my ‘Spring Beauty Favourites’ collection on my Luvocracy page. To enter the giveaway you must sign up to Luvocracy through the link I have provide bellow. It is important that you use the link I have provided, as it is their way of tracking you. The giveaway ends on MONDAY, MARCH 24, 2014 and the winners will be notified through email on TUESDAY, APRIL 1, 2014. Once you have been notified, you must respond within 5 days or the prize will be forfeited.